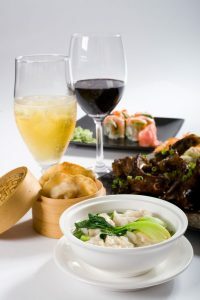 Pairings with Chinese Food | What Goes with What? I have come across some more specific recommendations for wine and Chinese and still can’t believe how little is actually written about it. Again my reminder stay away from big tannic wine and think soft and fruity as in a fruity rosé – the Merlot based ones from Bordeaux such as Château de Sours are perfect. Champagne or sparkling wine is the ideal answer with dim sum – both the steamed and deep fried variety, especially when stuffed with shellfish. It also goes well with lighter stir fries and steamed fish and vegetable and with the more delicate flavors of Cantonese food. This is where off-dry wines score best and why fruity rosé works so well. Can’t believe I’m saying this but White Zinfandel (actually a rose’) works well with these types of dishes. Such as glazed ribs or crab in black bean sauce. Here fruity reds again come into play. Ripe fruity reds certainly tend to deal best with the hotter, spicier dishes like Szechuan beef try a Mourvèdre and a Grenache, both big wines but without excessive tannins. I haven’t done as much research on beer as I have on wine with Chinese food but I’m told that light wheat beers such as witbiers and Bavarian weissbiers generally work well with Chinese-style snacks such as prawn dumplings and spring rolls and can also handle sweet and sour flavors. Belgian ‘brune’ beers like Leffe Brune are a good match for duck with hoisin sauce. Dishes like glazed ribs or beef in black bean sauce also pair well with brown ales and Belgian triple beers.